You have other symptoms along with increased pulse. 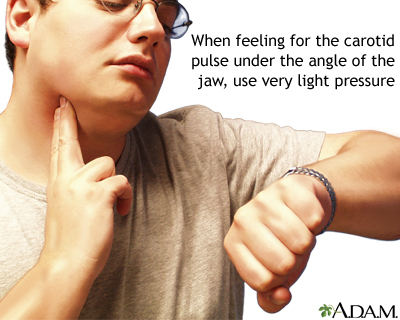 The change in your pulse does not go away when you rest for a few minutes. You already have been diagnosed with a heart problem. Your provider will do a physical exam that includes checking your temperature, pulse, rate of breathing, and blood pressure. Your heart and circulation will also be checked. Is this the first time you have felt a bounding pulse? Did it develop suddenly or gradually? Is it always present, or does it come and go? Does it only happen along with other symptoms, such as palpitations? What other symptoms do you have? Does it get better if you rest? Have you been very anxious or stressed? Do you have other heart problems, such as heart valve disease, high blood pressure, or congestive heart failure? Do you have kidney failure? Fang JC, O'Gara PT. The history and physical examination: an evidence-based approach. In: Zipes DP, Libby P, Bonow RO, Mann DL, Braunwald E, eds. Braunwald's Heart Disease: A Textbook of Cardiovascular Medicine. 11th ed. Philadelphia, PA: Elsevier; 2019:chap 10.